EDRM: Does Your Left Side Know What Your Right Side is Doing? The left side of the E-Discovery Reference Model is often overshadowed by the right side, Technology Assisted Review. However, even the best TAR protocol will falter if the left side of the EDRM is ignored. From information management to preservation and collection, the early stages of the EDRM are the easiest places for mistakes to spawn in an investigation, regulatory request, or litigation. 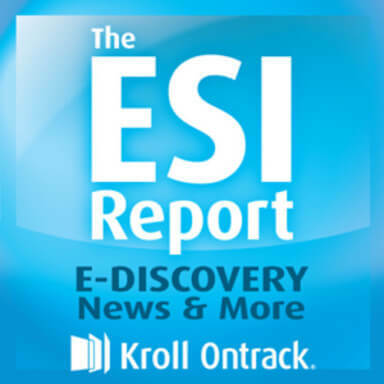 On this episode of The ESI Report, Michele Lange, Kroll Ontrack’s director of thought leadership, is joined by Kroll Ontrack Solutions Architect Troy Ronning to discuss the left side of the EDRM and why it matters. Troy Ronning has been working in information management software for more than ten years. Now, he works closely with the Ontrack® PowerControls™ software program. He provides technical support to external software partners and resellers. He also conducts product demonstrations, installations, and training. Ronning is also fluent in Microsoft® Exchange and SharePoint® management. Tune in to hear the details, challenges, and developments of the left side of the EDRM and why these stages are crucial to your success in e-discovery.